Today is the 12th day of Christmas and 12th night, the last evening of Christmas, is traditionally time for party at which a ‘Bean King’ is found. Finding the king involves making and then sharing a cake in which an uncooked and therefore inedible dried bean is placed. A Bean King is a version of the jester figure – like the ‘Lord of Misrule’. There are all sorts of winter traditions like this: in Scotland they had the ‘Abbot of Unreason’ and in some places the tradition was to make a ‘Boy Bishop’ – still celebrated on St Nicholas’ Day in Newcastle Cathedral. All these are versions of the same thing. And the idea is this: you put power into the hands of someone who has an eye for fun and mischief for a short period. Whoever becomes the Bean King or Lord of Misrule or whatever – that is person who must be obeyed. Thinking of this Cathedral, I wonder whether we shouldn’t find a way of instituting the idea of an Abbot of Unreason. I can imagine that there would be plenty of people willing to take a slice of cake in the hope of biting the bean which gives them the role, especially if there was a bit of dressing up to go with it – a pointy hat, or one with streamers, perhaps. My focus here is on Christian absurdity. But maybe you are beginning to wonder whether such a theme is legitimate. After all, St John’s Gospel begins with those great resonant phrases: ‘In the beginning was the word, and the word was with God, and the word was God’. And we know that the word ‘word’ here means something like ‘reason’ or ‘principle’ and that the nearest English equivalent to the Greek ‘logos’ is ‘logic’. Surely this tells us that our religion, our life, should be reason-led and reason-seeking. Surely it tells us that God is a God of order – not chaos; of rule – not misrule; of maturity – not childishness. Surely, if Christian spirituality is anything it is a spirituality of seriousness, of responsibility: Christian people should be good people living good lives, not rascals getting up to goodness knows what and intent on all sorts of naughtiness and mischief. I have to admit that there is something truth in this. It is theoretically true that we should be better than we are, and try to do the most reasonable thing at the time. ‘Oh be reasonable,’ is plea which we should indeed hear as a rebuke. But this is not the whole story. Christianity is not a religion of pure reason. Or to put it another way, Christianity is not a theory. And God, my friends, is not an idea. ‘In the beginning was the word …’ Yes indeed, but that word became flesh and dwelt among us – pitched his tent among us. The problem, of course, is that we’ve heard the story so many time before. ‘The word became flesh’ – is this not, when you think about it, the birth of the absurd? John did not write that the theory became the practice; John did not say that the plan was implemented; John did not say that the ideas were at last applied. What he said was the word became flesh. We have a technical word for this – incarnation – en-flesh-ment. It does not mean that the divine principle is at last ‘applied’ to human life. It means that God became human. There – Christian absurdity named. I think we are missing plenty of tricks when it comes to mission and evangelism these days. One of them is that we are determined to present to the world our most serious, considered and formal face. But the truth is that the world isn’t much interested in po-faced, self-admiring, seriousness. It’s attracted by the possibility of the absurd breaking into a world that seems to be going to hell in handcart. The world is interested in the hope that knows that it is itself absurd – and yet persists: hope against hope. The world is interested in the faith that look less like reason and more like magic. It’s not magic, but to the uninitiated it can easily seem like it. It was magi who came to worship the Christ child after all – magicians. This is one of the reason people like Pope Francis so much. He’s absurd. Just for fun he phones up some Argentinian nuns in Span. No one answers the phone, so he leaves a message. ‘What are all the nuns up to which means they can’t answer the phone. It’s Papa Francesco here. I’ll call back later.’ Of course it’s random and absurd but it’s also human. We can all connect with that. Christianity is a religion of profound human equality – fellowship – solidarity – but for one contingent reason after another we have made it something else. That’s why we need Lords of Misrule and Abbots of Unreason: to destabilise the Babel towers of pompous stuffiness, management-speak and the quasi-order that stops the gospel doing its upsetting and liberating work. When we talk about mission these days everyone knows that it’s ‘Messy Church’ that is making the running. If you want to know what Messy Church is you can go to one of loads of churches around the diocese that are having a go in their own way. It’s usually based on craft activities and the like, and it is hard work, but the point is that it gets people through the door and beginning to explore the Christian faith. It gets people connecting to the gospel. My own personal theory is that messy church is not really about the activities but about the atmosphere. What makes it work is the understanding that ‘this is for the likes of us’ and, ‘we can come along as we are and not be made to feel like outsiders’. But all this is also absurd. I just ask myself what an Anglican priest of fifty years ago would have made of it – someone for whom the said service of Holy Communion according to the Book of Common Prayer (BCP) reflected the ‘decently and in order’ requirements for liturgy that were all important back in the day. I don’t want to knock that generation; and when it came to Christian absurdity a lot of them had it in spades. My wife’s’ grandfather was of that ilk. At the BCP Communion Service, having invited the people to ‘make your humble confession to Almighty God meekly kneeling upon your knees’, he would then arch his head round to see if any were merely sitting on their bottoms. If they were he would tut three times very loudly. Now that’s Christian absurdity – but it’s not the right sort of absurdity for our mission context today. Mission today needs the right sort of Christian absurdity to cut through the walls of resistance and to open a possible pathway from estranged humanity to the humble God. But is not just a church thing its a personal thing for each one of us. Each of us in our own spirituality must constantly be alert to our own absurdity, and see it as a gift from God. We need to learn how to see something Christlike in our own absurdity. We should relax, because however daft we are, at least we are not the word made flesh. That is the high and holy absurdity of God. So: come let us adore him – with a song in our hearts and smile on our faces and make a twinkle in our eye. And as Christmas blends into Epiphany on Twelfth Night, let us see God wink at us from the manger. I was looking the other day at a facsimile of the first edition of the Book of Common Prayer. Like a schoolboy my eye lingered on the calendar and I noticed the words ‘O Sapientia’ on the 16th December. There isn’t much Latin in the Book of Common Prayer, but here was ‘O Sapientia’. How mysterious. It wouldn’t have been mysterious to the monks of Durham, or the monks of anywhere else. Nor would it have been a complete mystery to readers of our own fortnightly service and music list. If you look at our fortnightly you will see that the words appear on the 17th. But why are they there? You wouldn’t have heard them if you had attended a service here that day. What you would have heard, however, if you had been at Evensong on the 17th was a plainsong antiphon sung before and after the Magnificat. That antiphon however was sung not in Latin but in English. Not ‘O Sapientia’ but ‘O Wisdom’. In fact, if you look up No 503 in the New English Hymnal you will find not only the words of that antiphon but the words of seven more. ‘O Sapientia’, is followed by ‘O Adonai’, ‘O Redix Jesse’, ‘O Clavis David’, ‘O Oriens’, ‘O Rex Gentium’, ‘O Emmanuel’, and ‘O Virgo Virginum’. That is: ‘O Wisdom’, ‘O Lord’, ‘O Root of Jesse’, ‘O key of David’ ‘O Daystar’. ‘O King of the Nations’ and ‘O Virgin of Virgins’. As in my old BCP ‘O Sapientia’ is located on 16th December, not 17th as in our service sheet. This can be explained by noting that it was the Sarum Rite, which was predominant in England at the time when the Book of Common Prayer was formulated which had the eight days ending with ‘O Virgo Viginum’, whereas in the rest of Christendom there were only seven days. The new calendar of the church thus aligns the eccentric English with the most of the rest. Now going back to the relatively familiar sequence in the hymn book it is clear that we have seen this sequence somewhere before. It is in the hymn ‘O Come, O Come, Emmanuel’. With the exception of the first verse – which is the last of the antiphons, they come in the hymn in the same order as in the calendar. I admit that for some while I have been assuming that the hymn is but a metrical form of the antiphons. Studying the hymn more carefully, however, it becomes apparent that the hymn-writer has a taken one or two liberties, in addition to putting the last one first. In verse 2 ‘the way of prudence’ has become ‘salvation’s way’; in verse 3 the burning bush is eclipsed altogether by Mount Sinai; in verse 4 the lion’s claw has popped up without any clear invitation; the 5th antiphon’s emphasis on releasing the prisoner has been replaced by the prayer to ‘bar the way to death’s abode’; the sixth verse, ‘O Oriens’ or ‘dayspring ‘– now rightly aligned with the shortest day and longest night – is the closest in spirit to the original antiphon, whereas in verse 7 the antiphon’s emphasis on creation ‘fashioned of clay’ has been replaced by a much more miserable emphasis on ‘the ruin of our fall’. And in the final antiphon- which is now the first verse, the antiphon’s emphasis on ‘the hope of the nations’ has shifted to concern about ‘captive Israel’ that has gone in to ‘exile drear’. This is of course emphasised in the refrain. When you put all these changes together you will see that this adds up to a complete reframing of the whole sequence of antiphons. The hymn itself was written in Cologne in the early eighteenth century. It’s medieval sounding tune and use in procession, suggest that it might come from the very dawn of Christianity. Do not be so easily mislead! The hymn: ‘O Come, O Come Emmanuel’ is a protestant hymn, not a translation or reiteration of the Great O Antiphons, but a radical reimagining of them. But what more can be said of these antiphons which mark out a week at the end of Advent with these deep Biblical images of wisdom, key, root, dayspring and so on? Certainly they are all biblical images. Indeed two of them popped up in our second reading today from the very last verses of the Bible (Revelation 22. 16): ‘I am the root and the descendant of David, the bright morning star’. And they are all images – not propositions. They connect with the spiritual part of us, the poet within, and invite us to exercise our imaginations. This happened in the days of Durham monastery. In the Rites of Durham you will read of the tradition of each of the monasteries’ office holders or ‘obedientaries’ ‘keeping their O’ in Advent. This involved two things. First being the cantor to sing the antiphon and second hosting the party in the monasteries’ Common Room, the only place with a fire to keep warm by. It sounds like a pleasant and convivial thing to do; not least when you being to imagine what it might have been like to be in this great Cathedral for hours on end through the winter months standing in prayer. No wonder they wore heavy robes. And no wonder they went on many processions around the place. I think it was probably to help them keep warm, to keep the circulation going as much as anything else. Clearly the monks had some fun with this idea of keeping their O in the days before Christmas. Who kept their O on the day of the root of Jesse? ‘The Gardener’. Whose turn when it was King of the Nations? ‘The Provost’. And on what day should the Treasurer keep his ‘O’? ‘O key of David’ of course. From this I learn two things. First: that the O antiphons have always been something to spark the wit and the imagination of Christians. And second: that the pre-Christmas party, so frowned upon by clergy of a certain ilk, has long been part of the actual life of the Church and celebration of Christmas, though the Rites of Durham are careful to say that these little banquets of dates and raisins, ale and cakes involved ‘no superfluity or excesse but a a scholastical and moderate congratulac’on among themselves. And a further note adds – ‘a very moderate one without superfluety’. The imaginative response to the antiphons continues to this day. Just a few years ago the singer-songwriter, Malcolm Guite, who is also an ordained poet, produced a cycle of sonnets based on the antiphons. Today is 22nd December ‘O Rex Gentium’ or ‘O King of the Nations’. Let me read first the antiphon and then Malcom’s sonnet – which connects the images of the antiphon with the prophet Isaiah’s image of the suffering servant. And let me conclude with an effort of my own: a poem-prayer which reflects on how our desires are shaped today, and draws on the Latin phrase translated ‘cornerstone’: ‘lapsique angularis’. softer than putty or warm butter. Sermon preached at the Festival Eucharist for St Nicholas-tide at St Nicholas’ Cathedral, Newcastle 7th December 2013. I was delighted and honoured to be asked by the Dean to preach today. We agreed early on that I should talk about generosity: a good theme for St Nicholas’ Day and St Nicholas’ Cathedral and without doubt a very good thing at any time. An excellent theme, in fact. Indeed I have been giving myself a hard time trying to think of what anyone could possibly say against generosity. The best – or is it worst – that I could come up with is the idea that someone is generous to a fault. Now that’s a strange figure of speech and I wonder whether people really mean it when they say it. ‘She is generous to a fault – she gave her lunch to a homeless man’. Is that a fault? I’m not sure it is. The best I can make of the phrase is that it contains the hint that our generosity should be wise – or at least not pushy. You could say that Father Ted’s housekeeper, Mrs. Doyle, was generous to a fault – insisting on that cup of tea or slice of cake. But pushing thing onto people because you want them to have them (after all you have made them) is not the same as generosity. St Nicholas has become an icon of generosity – and is beloved of, and understood by, children. The desire to give is deep within us and fundamental to human nature. Children love to give – and so do older people. The desire to be a giver is one of the best things about human nature and it is expressed in many ways by people who have not become too self-absorbed. So relatively simple people are often generous with hospitality, their time and their respect and gratitude. This is something travelers often notice when they visit poorer parts of the developing world and it is something that we are in danger of losing in the relentless rush of individualism, careerism, materialism and general me-ism that is sweeping over our society today. St Nicholas is legend and an icon and Santa Claus is great because he can tell us something fundamental about God – for God is pure generosity. God is the endless source of love which continues to give itself regardless of whether or not we deserve it. God is supremely uninterested in whether we deserve to be loved. God just loves generously. Michael Ramsey famously said that God is Christlike and in him is no unChristlikeness at all’. He might just as well have said. ‘God is generous and in him there is no ungenerosity at all’. God is generous to a fault you could say – except that God has no faults. As for human beings, we tend to be very interested in our own worthiness, but we are obsessed by our unworthiness. We feel that if only we were better people then our relationship with God would be better. It’s a popular delusion but it’s wrong. Our relationship with God is in a good place when we realize that our primary spiritual task is to accept and receive the love of God; to enjoy and respond to God’s generosity. To the extent to which we know ourselves to be bad or unworthy people, so our gratitude increases. This is very clear from the story in Luke’s gospel about the woman anointing Jesus’ feet at the home of Simon the Pharisee – who doesn’t understand what’s going on at all. She has been forgiven much – and so she loves much – and expresses it with generosity. Bergoglio discovered through mistake-making that mistake-making is indeed part and parcel of what we do in life. That doesn’t make it okay. But God puts it right again by the generous expression of mercy – and the word for that is ‘forgiveness’. Let me spell it out. For-give-ness. The word ‘give’ is at its heart. Take the ‘give’ out for ‘forgiveness’ and there is nothing left. That is one lesson every Christian person should be very clear about. You never earn your forgiveness; it’s always a gift expressing not your worthiness but God’s generosity. Equally you never forgive other people because they deserve it. It is always your gift to the undeserving. If anyone tells you that they have earned your forgiveness beware – they are trying to manipulate you. Your forgiveness is yours to give. If it’s not given it’s not forgiveness. On Thursday evening this week, Nelson Mandela died. As I watched the news coverage unfold it occurred to me that I have never before heard the words ‘forgiveness’ and ‘reconciliation’ so many times in one news broadcast. The airwaves and the internet have been full of the same vocabulary ever since, as people have sought to find ways to express their appreciation of Nelson Mandela’s life and leadership. I spent a couple of months in South Africa in 2002. As time went by so I realized that many things that I had learnt about the country from books proved not to be true. But one thing that was truer than the truth I had picked up, was the respect and affection in which Mandela – Madiba – was held. The subject came up in all sorts of situations and was clearly heartfelt. Somehow Mandela had come to represent all that leadership should be, and that warranted real and deep respect. Everyone is trying to put their finger on what it was about Mandela. What was it about him that gave him such stature? In part it came from his determination and skill, his tenacity over the years and his intellect and his industry. But the more important thing about Mandela was his attitude and demeanor, his forgiving heart his desire for reconciliation. This is what people noticed about him as he walked free from prison and as he took up leadership. ‘Let bygones be bygones’, he said. Let the past be the past and let the future unfold with justice, mercy, truth and peace. This was his great gift, a gift that he had within him and a gift which he shared with every step his walked and every word he spoke. A few years before that a man in Northern Ireland, Gordon Wilson made a similar witness when he said after his daughter was killed in the Remembrance Day bombing at the warm memorial in Enniskillen, ‘I bear no grudge, I hold no ill-will’. These were difficult words for him to live up to as time went by, but those who heard them on the Radio – and who heard them again in the Queen’s Christmas Day broadcast a few weeks later – recognized that they were hearing the voice of dignity. This is what generosity looks like when put under the most excruciating pressure. It’s not forgiveness exactly, but it is great generosity of spirit. Let me return to Nelson Mandela because I want to leave you with the suggestion that he gave the world not one great gift but two. The second was the gift of a forgiving spirit. This is the gift that settles conflict which has moved to the point where it can be justly resolved. But before that gift could be given there was another one, an altogether more difficult, controversial and uncomfortable one: the gift of defiance. Mandela’s first gift was to say that apartheid was wrong, so wrong, so inhuman, so degrading that he would resist it with his life and, if necessary, by sacrificing his life. This was Mandela’s gift of saying ‘no’. It is important for us to realize as we celebrate generosity that this is just as vital a gift as saying ‘yes’ and seeking reconciliation. As the teacher wrote, in Ecclesiastes, ‘There is a time for everything’. The thing about Mandela is that not only did he have great generosity of spirit; he also knew what gift needed to be given when. If he had come out of prison shouting for justice that would have been wrong because when he said ‘justice’ people would have heard ‘revenge’. If he had accepted easy, acquiescent peace when there was no justice and no hope of justice, that would have been equally wrong. Mandela’s generosity was guided by wisdom and supported by courage. And so must ours be. As Pope Paul VI one said, ‘if you want peace you must work for justice’. And we might add, ‘if you want justice you must work for peace’. This is the double heartbeat of the ministry of reconciliation: justice, peace, justice, peace, justice, peace. We must learn how to let our ‘yes’ and our forgiving attitude be a gift to others. And we must also learn how to let our ‘no, this is wrong and it must stop’ be a gift to others. And to be able to give either of these gifts with proper Christian confidence and humility we must learn, with Pope Francis, that God does not seek to admire our perfection but to forgive our mistakes errors and sins. That is God’s generosity. God’s complete forgiveness. Generosity is at the heart of the Christian vision of God, and at the heart of the Christian vision of life lived well – of human flourishing. Let us aspire to be generous to a fault. Being prepared to give what is needed when it is needed. It’s the only fault that doesn’t need to be forgiven. We are supposed to wonder what they saw… the people at the wedding at Cana where Jesus got involved and things started to change in unexpected and yet profoundly positive ways. The steward – we know that he was a bit affronted. This crowd had clearly got the wedding wrong. And as the master of the house he didn’t like that. He had worked hard to get the reputation as a properly traditional place. He saw the danger if word got out: this is the place where tradition is stood on its head. You can’t market weddings on that basis. Nor religions. Topy-turvy spirituality is always going to be a tough sell. When it comes to things of the spirit we need to rely on order to keep it safe. For the steward there was threat in the sign of new wine. And the chief steward was probably right. Then there are the servants. We don’t know anything of their response. They are silent. But they are also ‘knowing’. The story tells us that they knew something that the chief steward did not know. That’s an interesting thought: the nameless and voiceless ones being the knowing ones. This is a another angle on the Christian idea that it is the little ones, the poor, the vulnerable, the nobodies who are God’s insiders. We could think too about the other guests, among them Jesus disciples. There is nothing to suggest that they have a clue what is going on. They want to be close, they are trying to follow, they have enlisted in Jesus’ eternal-life coaching course but they are distant, ignorant spectators in this the first sign. Maybe this is where we are doomed to be – those of us who opt into the Christian thing – at a frustrating arm’s length from the action which Jesus shares with those whom he loves and for whom he came – the lowest of the low. Then there is his mother. She not only knew what was going on but was ahead of the action and initiated it. It seems that Mary was woman of real intuitive power, as well as of considerable inner strength and courage. She calls her son to step up to the plate. She knows that his time has come before he does. That’s often the way with spiritual vocation – those who have known us a long time and attend to us closely can see where it going better than we can ourselves. Not even Jesus was the master of his own vocation, his calling, his timing. That’s a lesson to the rest of us. We are not all control-freaks of course. But we are all would-be control freaks when it comes to the story of our lives – wishing we could write an admirable autobiography by making the right decisions at the right time. Except that we can’t – because when we look back over our lives we realise how little our own opinion, our own motivation, our own desire to control outcomes had to do with what ended up happening. And what of Jesus’ perspective? Is he really the play-maker here – or is he – as I am suggesting, making a difference by being obedient rather than by making a decision and delivering a plan. He took the nod from his mother – after a brief, if spirited, protest – and then just did as he was asked. And it was transformational. Then, at the end of his story, when the steward challenged the groom … we hear nothing of his answer and nor did Jesus step in. It seems that he said nothing. As he did when Pilate got round to asking what he thought was his killer question: ‘what is truth?’. I love Jesus’ silence at this point. I imagine a knowing shrug. There is no answer to the question because the crudeness of the question corrupts the language so much that to continue the argument is pointless. I see this too in the rebuke of the steward. ‘Too bad’, thinks Jesus. The new wine is here. You might want to argue the toss with me but, well. there’s no point. You might as well just enjoy a glass – or two. We seem to have about 1,400 pints to go at. Jesus turns water into wine and inaugurates a new celebration, a new way of looking at things, a new reality. The jargon word for that newness is ‘kingdom’. It’s become a very much more important word in Christian preaching and teaching over the last generation or so. That’s unfortunate in some ways, as it is impossible to rid the word of its tinge of worldliness, patriarchy and its hierarchical and royalist associations. It seems to suggest something traditional but given a modest twist. But the story of the wedding of Cana blows all of this away: the kingdom of God is a better booze up. When Jesus answers the call and begins to act then tradition goes out of the window, the stuffed-shirts get affronted and the nobodies suddenly find themselves very close to the action – the outsiders become the insiders and water becomes wine. The ordinary becomes extraordinary, the mundane the very special. We are used to calling this a miracle. It’s certainly quite a stunt. But John calls it a sign. We need to read this sign, or maybe even allow it to read us – to challenge and impinge on us deeply. We need to let it get under our skin, into our minds and hearts, to slip surreptitiously into our soul. We need to let it inform our actions and our attitudes, to let it shape our mind-set. The sign of Cana is a sign of transformation, a sign of newness, a sign that God’s agenda subverts and transcends the world’s agenda, just as it subverts and attends our own personal agenda, our personal expectations, our personal hopes. There lies the challenge for us. Not that we should seek to emulate the actions of Jesus, but that we should, like him, try to be obedient to the call to serve the purpose of God: the purpose of working with the ordinary stuff of reality, and the people who are in touch with it, to make a sign and give a foretaste of the eternal celebration of generous newness which is God’s plan and destiny. Fundamentally, the story of the wedding at Cana is one of transformation initiated by Jesus obedience to God’s call as articulated by his mother. So here’s a question: What is God calling you to do? And who is he using as his messenger? If you don’t know – listen more carefully to others. If you do know – obey! The feast of the Epiphany reminds me of my time as chaplain of King’s College, Cambridge because a spectacular image of Epiphany dominates the sacred space and the high altar. Ruben’s ‘Adoration of the Magi’ was painted for a Belgian convent but later given to the College and in the late 1960s the east end of the Chapel was re-ordered around it. Framed between two panels (which we closed with some ceremony and a sharp bang during the Stripping of the Altar on Maundy Thursday) this masterpiece creates an environment that’s both intimidating and inspiring. Celebrating the Eucharist with it behind you is a particular, not to say peculiar, experience. The sheer size of the painting, the scale of the virgin and the magi is intimidating. And you know all the time that there is tension between the bread and wine on the altar –which are the intended focal point of any Eucharist, and the compelling figures just over your shoulder and above your head. I used to like showing the picture to children. ‘Which one is God?’ I’d ask them, and they would invariably point to the king who looked most like Santa Claus. They find it hard to imagine God as a baby. We all do. 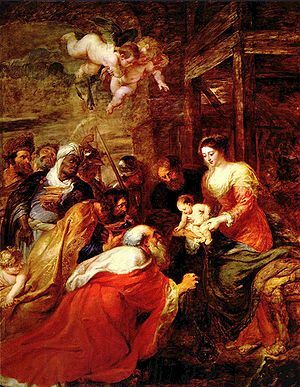 But for me the focal point of the picture is neither the bearded old man, nor the elegant and well-dressed young mother, nor yet the infant she is holding out for veneration. Rather it is the space between the old man’s eyes and those of the child. They are looking at each other. They are looking into each other. This mutual beholding, this mutual gaze, this shared and deep attention, is at the heart of Ruben’s great picture. And it is this which is at the heart of what we call ‘Epiphany’. The word means ‘manifestation’, ‘revelation’ or ‘discolsure’ but it is more than that, for the God who is revealed is remarkably like us in one important regard. The image of God here – the baby – is (and the point is obvious but needs to be made) of a human being with eyes. Epiphany is not only about seeing God but about being seen by God. Indeed we can only ever be aware of a God who is aware of us. You can’t creep up behind God or expect to catch God napping. God is pure attentivity. God is divine awareness. God is loving-alertness to us, whatever our state or condition. This is the discovery of the prayerful soul or the spiritual pilgrim. Not that they go on a journey and find some image or symbol that sort of hints at the essence of God or summarises a high ethical principle. The true pilgrim’s destination is found only when they find themselves attending to God’s attentiveness and realising that it is a loving attention. And the pilgrimage becomes a deeper journey of faith when, having seen the seeing-one, they do all they can to live in such a way as begins to justice to this loving eye at the centre of all reality. The second Epiphany theme that I want to explore is that of gifts and giving. The story suggests to me that when they set off on their journey, the magi were not necessarily on a gift-giving mission. It was in response to what they saw – what they felt and how they interpreted it all – that they opened their treasures, rummaged around a bit and found three things that were appropriate. This is not the same sort of gift-giving as we have been practising – with more or less élan and success – over Christmas. The magi did not make a special purchase and then gift wrap it. Rather they carted all their choicest things along and gave something of their own, a treasured and symbolically significant item away. These gifts from the treasures are simply accepted. A lot of theological ink has been spilt over the question of gifts and giving in recent years. And rightly so, it is a worthy subject for deep refection. The anthropologists tell us that every gift that is given creates a debt and demands a reciprocal response. The story of the Epiphany does not follow this logic. Not so much as a ‘thank you’ transpires. Of course these gifts from the treasures of the magi are not actually the primary gift here. They are a response to the primary gift which is the gift of the child. Nonetheless, I don’t think we see here that quid pro quo reciprocity of gift-giving in this passage, nor do I believe is it a Christian understanding of giving. When Christians give, it creates no obligation in the recipient. We give not as part of closed process of give and take but because we are part of God’s gracious flow of giving. The business is not circular but linear: like a river the flow of giving runs ever forward. We know that we have received more than we can make any adequate response to and yet this does not burden us with guilt or duty. Rather it liberates us to live with a similar gracious generosity. All is gift in Christianity, and gift in the pure sense. At the heart of Christian thinking is the idea that a gift is a gift is a gift. You can never justify receiving it or respond adequately. All you have to do is enjoy it – for ever. I have offered a sermon in two halves this morning: the first about worship the second is about giving, but it is wrong to hold the two apart. The story of the Adoration of the Magi teaches us that the deeper the worship the more authentic, thoughtful and generous the giving. It is the vision of God that is the inspiration of giving – not because we want or need to give anything back, but because we see that giving as such a delightful and divine activity. Giving is the opposite of self-regard, it is the ultimate turning away from ourselves; it is the turning towards others and God. It is the surest way to obey the two great commandments – love God and neighbour. We love God by doing in our own way what God does and we love our neighbours by making available for them what we have, own and process. By giving I do mean financial giving, but also the giving of ourselves in volunteering or even through paid work – for it is possible to work generously and wholeheartedly, obedient to the needs of your organisation but nonetheless pouring your energy your heart and soul into it. Indeed vocational living is all about giving away your best gifts in the service of God’s mission of love. So yes, real giving is the giving of that which we own and treasure, material and spiritual, financial and in-kind. We feel the loss when we make a real gift, but nt imply loss, we know again and again that strange combination of delight and depletion which is the only reward of true giving. Such giving is not an optional extra in the worship of the Christ-like God. It is intrinsic to it. When we hear that the wise men opened their treasures we should indeed feel the call, the inspiration, to do the same. Not because it is a difficult duty or an attempt at reciprocating, but because it is the most graceful, wise and true response we can make to the glory and love of God. God is pure gift. And we most profoundly bear God’s image, most accurately reflect God’s glory and most clearly reveal God’s grace when and as we give. The Bible commentaries say that today’s short gospel passage – 8 verses from Mark 13 – need to be read in the context of the rest of that chapter. I am not going to read those 29 verses – but I can assure you things don’t get any better as they go along. To cut to the chase … They tell us that the past is no guide to the future. And the metaphor of the big stones of the Temple – symbols of solidity, steadfastness, safety and sanctuary are misleading if we take them too literally. Yes, they have been there a long time, but there is no such thing as future-proofing. Jesus speaks of birth pangs of a new age. That sounds painful. But the metaphor of birth pangs is not quite strong enough. For while they are very sharp pains – or so I am told – they do pass and, as the Bible tells us elsewhere, they are forgotten when the joy of new birth happens. But the kind of change that is being spoken about in Mark 13 is more like the birth of a chick than a mammal. If you have ever come across a spent eggshell in the wild you may well feel a twinge of excitement. Some new life was launched just here. You may admire the fragile beauty of the shell fragment, but you will know for certain that the shell is now useless. A spent shell is an ex-shell. All the king’s horses and all the king’s men will never put it back together again. Mark 13 is a vivid lesson in the uselessness of the past. From the fig tree learn its lesson. It tells you not of what has been but of what will be. Time ticks forward, not backwards. Mark 13 is not optimistic about the future. He out does Noel Coward’s amusing them of foreboding by a long chalk. Coward’s song, ‘there are bad times just around the corner’ has the chorus ‘Hoorray , hooray, hooray, misery’s on its way’. But what does Jesus say is coming? As we know, Jesus was very astute about events and very astute about people. He knew that they derived a certain kind of spiritual solace from the very stones of the Temple. And he knew that this was misplaced. Time and again he told people not to trust in that which is ephemeral. He warned people against the wrong sort of spirituality and the wrong sort of treasure. He warned people to be very careful in the assumptions that they make about the true scale of values. He was ahead of Oscar Wilde’s famous quip about the man who knows the price of everything but the value of nothing. Both might have saved their breath for all the notice that most people take. For to discover and hold fast to the truth worth and value of things is a spiritual quest – and demanding and a very lengthy one. Often it takes the form of dispossession. This is the everyday asceticism whereby we are formed in faith and hope. ‘You don’t know what you’ve got till it’s gone’ sang Joni Mitchell in the sixties. Those were the early days of ecological anxiety. She sang of the misplaced aspiration in the memorable image of a ‘paved paradise’. Since she sang it the destruction of the natural environment has continued to accelerate and the number of paved gardens has increased exponentially. She too might as well have saved her breath… except of course that if you stop saying things that matter, you might as well not bother living at all. Shall we answer the question? Not definitively. Not in words. But one way of describing a life well lived would be to describe it as an attempt to see, feel, touch, hear and share truth. All our negotiations with truth must be tentative. We know our capacity to be wrong and get things wrong so well that to think of the Truth with a capital T coming from us seems at best improbable and at worst impossible. And yet we also know that to give up on truth is to give up on life and to undermine our capacity to live with integrity today and tomorrow – and even more, it destroys our capacity to hope. That is why Jesus, like the prophets before him – and after him – have attacked so savagely the unreliable things on which people place their hopes. It’s because they tempt us to build our hopes on the vain things that pass away. Now: let’s make this local. There are three great buildings in this city that impress beyond all others. The Cathedral – the Castle (which let us say represents the University )and the prison. We trust in them all in different ways. We let them symbolise our identity our wisdom our security. We trust in them – and we probably trust in them far more than we should. We build vain hope on them all. They look durable, of course. And we expect them to outlive us. Someone said to me the other evening that she had just been to Fountains Abbey and how much fun it was to work out how all the buildings connected together and how it was just like Durham – except that it was dead. The spirit was not there. You don’t need to imagine this cathedral a ruin. You just need to pop down to North Yorkshire. That conversation was in the context of my presentation about the Open Treasure project. I recently preached in some detail about it at Matins and so won’t say much now but by all means check it out on the website. But we should perhaps note today the audacity of the Open Treasure project’s title. We are daring to let people associate the building and the collections here with the idea of ‘treasure’. That is a risk because it can be misleading, But you can be sure that when the Chapter came up with the phrase ‘Open Treasure’ it was not only to express our commitment to practical and spiritual openness here, not only to commit ourselves to physical and intellectual access for all to our history and collections. It was also to signal the idea that all this physical stuff – however venerable, however fascinating, is pointing beyond itself to the truer treasure which is the love of God as made known in Jesus Christ and constantly renewed in us by the holy spirit. The open treasure of which we speak here – the ultimate open treasure is the gospel, the good news of God and our invitation to make the love of God not only our first priority but our overriding purpose. Open Treasure is our best plan to go forwards to God’s future positively. But it is not the creation of false heaven. The new shop is pretty good but it not that. Nor will anything else be. It is all, however durable it looks, ultimately ephemeral. But the word of the Lord and the love of Christ endure for ever. That is our true hope and our open treasure. And if that is what we say of the Cathedral what should we say of the University and the prison? The idea of a University is of a place where truth is sought and where the process of acquiring knowledge, accumulating truth and developing wisdom is a continuum across the spectrum from research to education. Since the rise and rise of science human understanding has grown at an astonishing pace – and yet the capacity of human beings to live wisely with their new knowledge is a different matter. Since the Garden of Eden we have wanted to know but been unable to predict the consequences of knowing. Humanity is in a way the ultimate experiment – the experiment to see whether intelligence is a good thing or not. Universities are based on the assumption that it is and that progress can be intellectually driven. The University has a slogan’ Shaped by the past – Creating the future’. It is not a phrase that goes well with Mark 13, which invites us to be shaped by God’s coming future and to recognise that our capacity to create is limited indeed. But in the end, that is, sooner or later, there will not be one red brick left upon another. All will be transcended. The age of learning will come to an end. Whether to be replaced by the Armageddon of war or ecological meltdown we do not know. But in the end we will realise that we are not quite as clever as we think we are. The wisdom of the wise will one day be shamed. That leaves only the sturdy and stout edifice of the prison standing. Built for about half the number of prisoners it currently holds, Durham prison should long ago have burst at the seams. But its seams are strong. Reinforced concrete and countless hours of work on the part of prison staff keep it secure. Prisoners don’t escape these days, – though the prison is far from impermeable to drugs or information, making it, like all our penitentiaries not places of reformation but school of crime and theatres of woe. But surely, someone says, prisons will last. Surely the future of God will not open the prisons and free the captives. Not so. One thing we can be sure about in the age to come this that the prisoner will go free. The new earth of God’s kingdom will not be dotted about with places where felons are locked away. It will not be a community where the weak willed and evil are cast aside. It will not be a place where people can live lives of complacent quasi-goodness because the victims who make yet others their victims are banged up. God’s future is one in which not one window will be barred to prevent escape, not one door locked, not one length of razor wire left in place. The structures and edifices which make us safe at the expense of community and solidarity will be gone. The falsity of incarceration will be over – the truth of freedom will belong to all people. And that is what I read in Mark 13 – when taken as a whole and translated locally. The past is a poor guide to the future. God is preparing for us a kind of living which we can no more imagine than a chick in a shell can imagine soaring in the sky or diving into the sea to catch a fish. And yet we have heard an advance report, we have been encouraged and warned. Not one stone will be left on top of another, not one red brick, not one barred window. All shall be changed. And all shall be well: by God’s grace and in God’s time.